To Dog With Love: What If You Could Take Your Dog to the Gym? What If You Could Take Your Dog to the Gym? If you could take your dog to the gym with you, do you think you'd be more apt to go… or go more often? That's the idea behind K9 Fit Club, one of the newest ways for people and their pups to get and stay fit and healthy together. Most dogs are always ready to go on an adventure with their people, making them the greatest motivator to get you up and off the sofa. And for those pups who would rather sit on the sofa with you, it's possible they may need a little more exercise and healthy living too. More than 50 percent of U.S. dogs are overweight or obese and two in three adults are considered to be overweight or obese. That amounts to a lot of lbs that can be lost if pups and peeps would help each other out and get up and get moving together! That's a big reason why I went through the training to get certified as a K9 Fit Club instructor. Lucky for me, at a time in my life when it was getting really easy to pack on the pounds and blame it on just getting old, I had young pup Rocco ready to go at a moments notice. With the help of better nutrition (skipping the fast food) and more exercise, I'm back at my fighting weight, have more energy and building back the muscle I had before I had shoulder surgery a few years back. and pop up into your arms like Rocco did here! And now, I'd like to help other folks and dogs meet their fitness goals and have fun while doing it! Want to see what it's all about? Take a look at some of these K9 Fit Club regulars working out at the club that started it all in the Chicago area. At the classes I'm teaching now in the Atlanta area, we use a combination of human and dog exercise equipment like steps, hand weights, FitPaws balance discs and K9FITbones. We weave through cones, do agility jumps for the dogs and get in some strength and core training too, all to fun motivating music with your pup by your side. The programs and training for K9 Fit Club were developed by a team of veterinarians, physicians, psychologists, personal trainers and dog trainers. 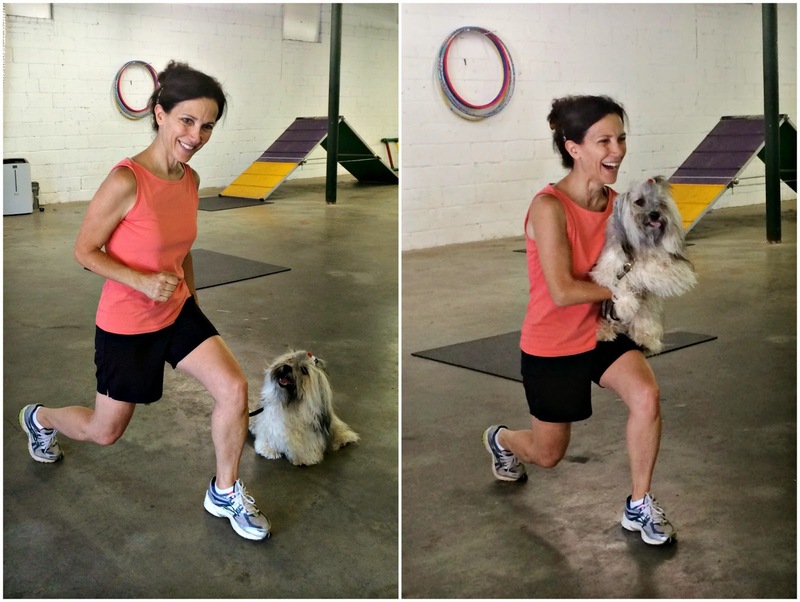 And working out with your dog can help you do more than just lose weight. Pets can improve our health by helping lower blood pressure, lessen anxiety and boost immunity. If you're in the Atlanta area and want to know more about taking a K9 Fit Club class, fill out our short form and I'll contact you with more info. If you're in a different city, check out the list of certified trainers for a K9 Fit Club trainer near you. Would you work out or go to the gym more often if you could bring your dog with you? Let us know in the comments below. That made us chuckle the thought of taking us to the human gym. We think keeping fit together is the best and most fun approach. Have a fabulous Friday. I would definitely be more likely to go to the gym if Barley could come along. I have thought about memberships to the ones around us, but the thought of being active without her makes me feel guilty--so instead we do our best to walk three miles a day and I work in some hand weights during commercials when we're watching tv. Maybe one day K9 Fit Club will make it's way to our neck of the woods! That is so cool, somehow I think us big dogs we would be tripping up mom like we always do in the kitchen! BOL! Great post!! I think it is perfect for those that like the gym environment. Mom is one that has to be able to just work out where she is. Driving to a club doesn't work for her at all, even with us, it wouldn't work. Many people need that motivation, so for them it would be ideal. Sounds like fun. Not sure my three would have the patience though. You look great! Bringing your dog to the gym would be tons of fun. This is fantastic! It would make working out so much more fun and I know my two would enjoy it. I really hope I get the chance to do this one day! I definitely would! I'm trying to decide if Mr. N would sit quietly through one of my yoga classes. Wow! That looks awesome! I wish they had something like that where I live! Absolutely!! I used to mountain bike a lot, but once we got dogs I chose forms of exercise that I can do with the dogs: hiking, walking, jogging. (I know you can bike with them too but that didn't appeal to me so much). I think these clubs sound great, but it will probably be a long time before I ever got one in my area. Kudos to you for becoming an instructor, and for being in such great shape! Thank you! Rocco has certainly helped motivate me! I would love to go to the gym with Laika, it looks awesome, wish they had one here. This is a brilliant idea! I can see them all over the country. Sounds like a lot of fun. It is something I may do with my Maya. But Pierson wants no part of a club that involves other dogs. That's one of the reasons I figured I better step up my fitness regime… otherwise I don't know how I'd keep up with Rocco on the agility field!